First post help. This is my first ranked game. I have played for a little while, only once in a while, but I still am quite a beginner in many ways. I am playing a game against a 10k ranked player on Dragon Go Server. He will give me an estimate of my rank after the game. My self-rank is 25k (following the recommendation to stay in the 25-30k range for beginners. 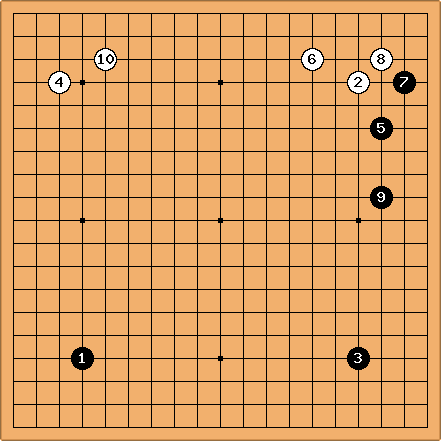 So, in your opinion, how is black doing after the first 10 moves? How can I ask about further movies? The game is more advanced now. A good way to ask longer questions is Big Question Mark. A bit inactive these days, but people will show up for answerable questions. In the game you showed, imo, you are both doing fine. Other players will play differently, but these are hardly the points that determines whether you are 20k or 10k. So far, you gave White the chance to take the enclosure and she took it. On the other hand White only played on one side and only low moves. Thank you for your answer! I will head over to the Big Question Mark area. Looking at the game, it looks to me like you are winning. That suggests you are around 10 kyu in strength. I think your self estimate is out by quite a few stones. I will see how the ranking changes after the game is over. Hopefully even if I lose, considering the rank difference, I won't drop too much. Most of all, the game is fun. The rank is just nice to eventually find well match games. Thanks for commenting.